Multitasking kills productivity, makes you dumber, might permanently damage your brain, and like everything that is really bad for you, it’s also highly addictive. Interested? Read on. We all like to think that we give 100% every day. But what does that mean? 100% of what? 100% of what we are capable of? What are we capable of? Don’t we need to ask the circumstances? What if the lighting hurts your eyes – how much more work do you get done with an ugly cardboard tent over you’re your head? What if the office is noisy with interesting conversation? How much more work would you get done if you put on some headphones? What should you choose to listen to? What if your back hurts from sitting? How much more work would you get done if you stand instead? What if your feet hurt? How much would you get done if you sat down? What is the temperature of the office? These variables, and many more like them are things that are studied, measured, and adjusted in order to raise the productive power of the most expensive resource a business has – human capital. Some of them have reasonably definitive answers. An ideal office temp is north of 72 degrees, instrumental music or nature sounds might shield you from distraction, and having a stand-capable workstation can increase call center performance by over 50%. But one particular variable seems to be continually pushed, despite actually hurting performance. That variable is multitasking. What Does Multitasking Even Mean? The idea behind multitasking is that we can work on multiple tasks at the same time, thus completing more work in the same amount of time. This sounds great as we all want to get more work done. But is it really true? There are some cases where it seems true. We can walk to the cafeteria while talking to our spouse on the phone. We can listen to the radio while driving our car. We can vacuum while searching for a solution in our head. We could call this multitasking, but we need to examine the actors involved. If we zoom out to a group of people, we can easily say they are capable of multiple tasks at once, right? But does it really make sense to say a group “multitasks”? Or is it just a collection of individuals each contributing an individual task? Looking at it that way helps us realize that maybe we jumped the gun on thinking of an individual as the smallest unit. The human brain is subdivided into multiple systems. The areas that manage motor function and habit are separate from those that are dedicated to critical thought. 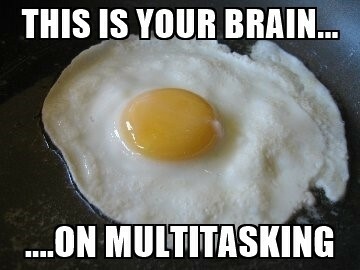 So it’s not that your brain is multitasking, it is that you have given the different parts their own task. Knowing this does have its advantages. We can take a skill that requires a lot of mental energy, practice it, and turn much of it into habit, thus offloading our critical thinking center for another task. Consider people with brain damage that eliminates their ability to form new memories. They can get back to a new house after a walk, or demonstrate knowledge of a practiced sequence, even when they have no memory of either. Tony Dungy won the 2007 Super Bowl not with a more robust playbook, but by turning player reactions to signals into habit, thus giving a reaction time advantage. But this is not true multitasking. We are instead taking advantage of collective systems. People swear that they can actually multitask, and that it saves time. Here is the bad news – a Stanford study found that admitted regular multitaskers actually performed worse than those that performed fewer tasks at a time. It found that multitaskers were more easily distracted by irrelevant information and had poorer memory recognition. This is actually exactly what a computer does. Contrary to popular belief (prior to the multi-core processor anyway), even your computer doesn’t simultaneously do work. It rapidly switches amongst hundreds or thousands of tasks to see if they have work to be done and gives them time to do so. It gives time to your keyboard driver to see if you’ve pressed a key. It gives time to your mouse to see if it’s moved. It gives time to the video playing in your browser to see if it needs to draw another frame. It gives time to Outlook to see if it wants to notify you of the arrival of a new email. This “time slicing” is happening thousands or millions of times in a second so it seems simultaneous to you, but it’s happening one at a time. But this switching isn’t free. The “context” – the related data – for the next task must be loaded. Just as important, cached information that was speeding up the last task is lost. And all the while the computer is using resources just to keep track of all these tasks and their needs. Your mind is the exact same way. When you are working on a task and something comes along, you must stop what you are doing, clear your head, and then attempt to focus on the new task. How often do you ask somebody to repeat a question, not because the question didn’t make sense, but because you hadn’t yet cleared your previous thought when they asked the question? You likely didn’t need it rephrased, you just needed it repeated without the interference of the old item still drawing your attention. Multitaskers may now feel vindicated and are rejoicing , thinking “Yeah, that’s what I do, I switch back and forth between tasks, but I can do it quickly and efficiently.” But unfortunately, the Stanford study found the opposite. When asked to switch identifying even numbers amongst a list of digits and vowels amongst a list of letters, people that favored multitasking still did worse than those that didn’t. But let’s also think about what this means to a company. If a completed task is billable or has ROI, that benefit to the company might continue paying long after you’ve moved on to something else. But if you split your time between two tasks, forcing you to take at least twice a long, the ROI you would have received for completing the first task first has been lost. For example, if I have two year-long projects that will each save $60k/year, I can deliver the first project in full, allowing the business to take advantage of that first $60k/year of savings. This allows the business to enjoy that savings while I’m working on the second project. But if I choose to work on both of these at the same time, both projects will take longer. I may deliver $120K of savings in my third year, but that was going to happen anyway. The $60k I could have saved had I finished that other project right away is gone. Even if we suspend disbelief and declare that multitasking shaves 3 months off of each project, the 3 year total ROI is still only $90k. I’m not suggesting that we turn our back on task switching within the space of good time management. I think we can all demonstrate that sometimes we must wait for something else to be completed and we might as well do something else in the meantime. But a 100% utilization is rarely optimal. Let’s add in a three-month delay in the middle of the first project and fill that with 3 months of the second project. We deliver $45K (9 months) in benefit by the time our second project launches, or $105K after the full three years. But if we “waste” a month of time that could be spent on development of project #2, and instead clear the blockers of project #1, we launch the first project a month earlier, and the second a month later, making time a wash. But we also put $5 in the bank a month earlier. Of course, it’s fairly obvious that it depends on the return of the two projects relative to each other. But we also had no conversation about what that delay actually was, or how inefficient it is when a project starts to flounder. We greatly simplify the story of two projects. Perhaps the biggest flawed assumption of the story is that we assume resources cleanly jump from project to project. Switching projects for those three months isn’t free. There’s certainly spin up time on the new project, and forgotten ideas on the old one. 100% utilization being optimal far from a given, and isn’t even likely. There's even a possiblity that a drive towards utilization with multitasking creates a disfunctional business. If multitasking and utilization is pushed as a good thing, we begin to consider the most "efficient" use of our own personal time. We draw lines with what is our responsibility vs someone else's responsibility. The consequence is that completing business inititives end up taking a back seat to "staying busy". Projects constantly wait for the next resource to free up, dragging out delivery dates or dooming a project to spin forever. On the other hand, the alternative to "stay busy" message can be "focus and get it done." This can increase the chance of people offering help outside of their job descriptions, creating a culture of "how can I help for the sake of this project." If you aren’t yet convinced at a personal level, let’s drop the bomb that multitasking makes you dumber, stresses us out, and might permanently damage your brain. Studies have shown that multitasking lowers your IQ to the same degree as sleep deprevation and marijuana use. Multitasking increases levels of cortisol (the stress hormone). There is even a correlation between people with multitasking tendencies and low brain density in the area of the brain that controls empathy and emotional control. While correlation does not mean causation, the hope that more focus at work allows us all to get along better with friends and family should be encouraging. As we jump around all day finishing tiny little tasks – answering that email that just came in or answering an instant message question – we get a little taste of satisfaction and a bump of dopamine, the happy-brain chemical. We start to crave those little bumps and go for more of them. 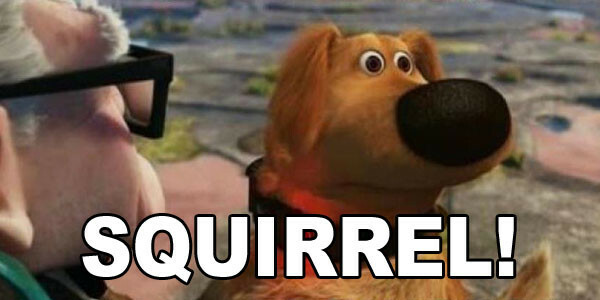 Seriously, how many people can resist clicking on the “new mail” notification for Outlook? We’ve made a pretty good case on how multitasking might be better seen as “work without focus.” If it was possible to take a single task and complete it, then that is what you should do. But in a workplace that’s full of distractions, that’s easier said than done. Keep office noise down to a minimum. Use the hallways, offices, and meeting rooms spaces for conversations. Designate days or weeks to get a fixed amount of work done, and don’t allow discussion of new work until the next time-box. Attempts to multitask drag down your work and your mental health. Breaking the habit can be extremely difficult, depending on the depth of your established habits. Give yourself time and patience to change to a focus-based approach to tasks, both at work and at home. Slowly, you may find that the satisfaction you gain from completing what you set out to do will give your brain a more effective reward, and focus will become as automatic as was responding immediately to distractions. Thanks to Christy for editing and closing.